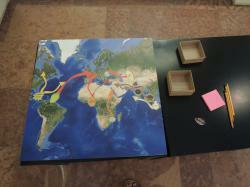 The final Museo Mundial Project installation at the Castle Museum of the Budapest History Museum highlights the concept of fair trade. 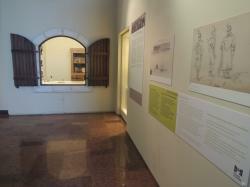 The installation is located in front of a reconstruction of a medieval shop in the section on “Fairs and Markets in Medieval Buda and Pest” in the museum’s city history exhibition. Texts on the walls explain the basic concept of fair trade. One part of the installation is a kind of puzzle fixed on top of a table. Visitors can search on a world map for the places where different items were produced. The items are coffee bones, bananas, cocoa beans and spices from the time of the medieval shop. Visitors can also guess trademarks and signs, and suggest markets or places where fair trade goods are available in Budapest or in other countries. Therefore, the tool is connected to Millennium Development Goal 8 (“Global partnership for development”). 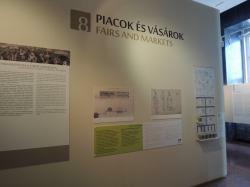 The visitor walks through the Workshop and Factory section of the exhibition into the Fairs and Markets section, where a medieval shop from Buda is reconstructed. Once visitors have familiarized themselves with the location of medieval markets, they may use the world map to retrace the routes of the spices and goods that may have been sold in the medieval store. In the same area, the visitor may also experience the smells of the market. Visitors may sit around the world map displayed on the desk and familiarize themselves with the logos and symbols on the products, such as the well-known fair trade logo. The aim of this part of the installation is to introduce these symbols on product labelling as well as the sustainable production and supply process. The labels used in the game certify organic farming, the sustainable production and supply process, and the fact that the product was manufactured in Hungary. Visitors have the chance to write down on Post-It notes suggestions on shops or websites offering fair trade products and stick the notes on the suggestion wall. The economic history of the capital and the role of markets within a big city is one topic displayed in the permanent exhibition. In fact, the trading stations on the trade route between the cities along the Danube played a defining role in the history of Buda, Pest, and Old Buda. Some products have been making the long journey from supplier to consumer for thousands of years; this is not unique to today. However, there is a great difference in the duration of the journey, the means of transportation and the packaging used. The reconstructed medieval store is an outstanding location to think about the journey, the price, and the packaging of products sold in the past. It was clear that this was an ideal context for introducing the terms "fair trade" and "sustainable economy". Right in front of the medieval store was an area suitable for another installation. Next to this area, there is already an interactive feature: a game with smells from the medieval market that encourages the visitor to participate. The multi-stage planning process took a long time since we tried to create an installation that is easily understandable and functions well without the need for intervention by museum staff. We have tried to use wear-resistant materials. To define the content, we consulted the curators of the exhibitions and we got advice from NGOs on the topic of fair trade. There are already publications for young people dealing with the topic of fair trade and some cases were used from these sources. When we want to explain more serious content through short texts, it is worth checking its effect on outsiders. The effect is greater if we formulate the message in a simple but clear manner. The installation is versatile and easy to set-up; only the small parts need to be monitored regularly. The theme of a sustainable economy is a really interesting topic that fits well with the topic of the permanent exhibition. Visitors enjoy the chance to sit around the table and have a conversation about the labels and topics in this section of the exhibition. 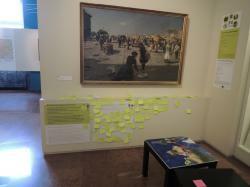 Visitors really like sharing suggestions with each other or having the chance to leave messages on the message wall. To tell the story or the process that a good undergoes from production to retail takes up a lot of space. Unfortunately, we had nowhere to place it on the wall, so the story has to be read while sitting at the table. Some parts of the installation are more suitable for use in museum educational programmes than others. Visitors from Hungary have usually already heard about the concept of fair trade, but they often do not believe in the power of their consumption decisions.